The crushing victory of Andrés Manuel López Obrador, known as AMLO, in the Presidential elections on July 1 is a turning point. After decades of PRI (ruling party) tyranny, military and police violence, privatization of strategic sectors of the economy, and reactionary labor and education reforms, millions of workers, youth, indigenous people, and women have won a victory resulting from decades of struggle. 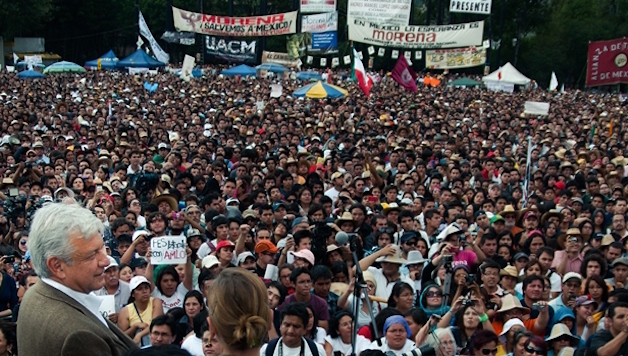 AMLO and Morena’s (movement for national regeneration) victory is above all a result of the tireless struggle of all the oppressed to transform society and end the nightmare of Mexican capitalism. At the time of writing official data has not been published, but first results confirm the crushing victory of AMLO with 52-53% of the votes, the highest vote for any president in Mexican history. Ricardo Anaya of the neo-liberal PAN won about 22% and Jose Antonio Meade of the ruling PRI 16%, in a disastrous election for the establishment parties. The atmosphere of euphoria among the masses is difficult to describe. It makes it even more important for the forces of the left and workers movement and social movements to understand the great pressure with capitalism, imperialism, and the state apparatus will now bring to bear on the new President. With the aim of appeasing the oligarchy and ruling class in Mexico and internationally, AMLO insisted during the campaign that they had nothing to fear as he was not contemplating any nationalizations or expropriations. However, the idea that a more “humane” capitalism can be built – in which bosses and speculators agree to share out their profits and reduce exploitation – can only end in a disaster. The same can be said of the idea of ending corruption without challenging the fundamentals of capitalism. The experience in other Latin American countries – Bolivia, Brazil, Venezuela, Argentina, etc – and in Europe – like Syriza in Greece – has taught us many lessons. All of these big bosses who AMLO “trusts” and invites to participate in his project will respond in the same way as their capitalist counterparts elsewhere: they will say – apply an economic policy in our interests, your only choice is to do so voluntarily or otherwise. AMLO’s victory is a great development, but in itself will not guarantee an end to exploitation and a lack of democracy. The Mexican ruling class is not only corrupt and cruel but also has a history of bloody repression when it is threatened. This victory will only lead to a real change for the masses if it is the launchpad for a struggle for a socialist program. We must hold AMLO to his word, and show him in action that to end with the privileges of the few, we must fight for a socialist program. Implement collective wage agreements. For a minimum wage of 12,000 pesos per month. Re-hire all workers sacked by the education reform and give stability in work to all teachers. For the right to free and dignified social services. No to feminicide! Fight for full democratic rights to the LGBT+ community. For a program of public works to provide childcare and food canteens for poor families. Nationalization under workers control of the banks and strategic sectors of the economy to guarantee the welfare of all.